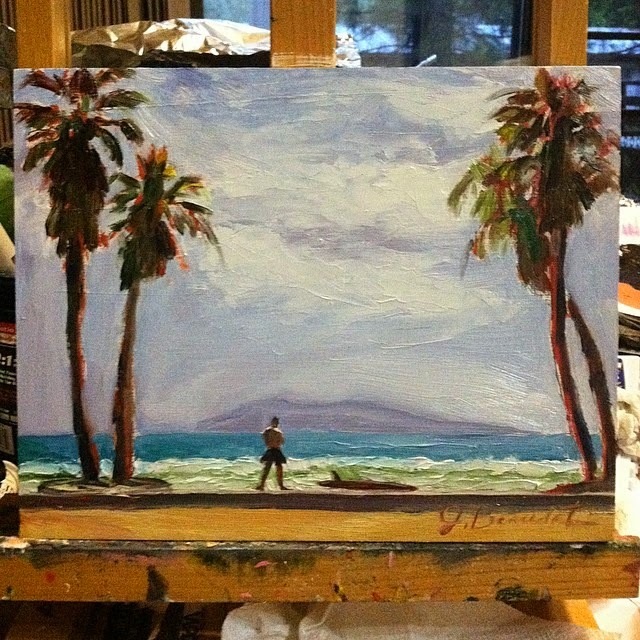 Jen Beaudet Art: Ventura Surfer Daily Painting Day 20! I managed to paint Day 20 and finished a commission at the same time! This one was for my brother who lives in Ventura. Of all the years I've been painting this is the first time he's bought anything from me! I feel accomplished. lol I really enjoyed painting this one because I used a raw wood panel with 1 1/2 inch walls (frame). He's going to stain the sides when he receives it and I think that will look great! I primed it 3 times so it would soak up the paint and that did the trick. I really like painting on this surface and plan on purchasing more! This photo was was from my instagram I finished another commission and have been varnishing the large paintings for Kincaid's! They're almost ready to ship! So, I've been so busy this month…not to mention my travels with my mom to the UC Davis Cancer Center. We're done for the month though and the next visit is her surgery! Can't wait for her to get that over with and be on the road to recovery! I think staying busy has been a good thing for me at this time. I tend to worry about things that I have no control over. Jennifer, I worry all the time over things I can't control. Yes, it goes against logic, but we are human! That looks like one of the Channel Islands in the Ventura painting background. I love how your subject is contemplating the waves. My step-grandmother...I barely remember her...painted on wood quite a lot, I think primarily because...in those days...it was affordable whereas canvas perhaps, not as much. Her wood choice...is it fake wood?...was masonite. Jen, I can hardly believe what you paint in a day's time. It is so utterly amazing. Your talent overwhelms me. Your brother is going to LOVE this. I think it IS good for us to keep very busy during times like you are going through. I'm sure your Mother appreciates your being by her side. Thank you Vicki! You're correct, it's one of the Channel Islands! I added to the painting from another photo he provided. I hope I got it right. Hi Susan! Thanks so much for stopping by:) I'm definitely being challenged by painting everyday like this! But it's great practice! I'm thinking of trying to keep it up after the end of the month….we'll see! I'm glad i'm here to be with my mom too. I had moved back to L.A. a few years ago but was brought back for a reason and now I know why! I have a very hard time living here but it's all worth it now. Take care and enjoy that sunroom!